On Jan. 31, 1990, George Cohon got out the gigantic scissors and cut the ribbon to open the first-ever McDonald's restaurant in Moscow. Perhaps Russia's beloved poet Alexander Pushkin would have been puzzled. 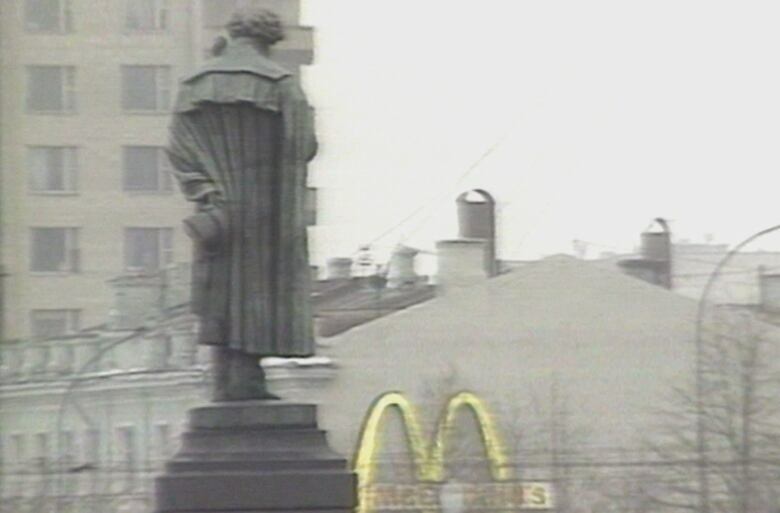 Under the gaze of the statue of the famed Russian writer, the lights were turned on under the golden arches, the symbol for many of fast food in North America. 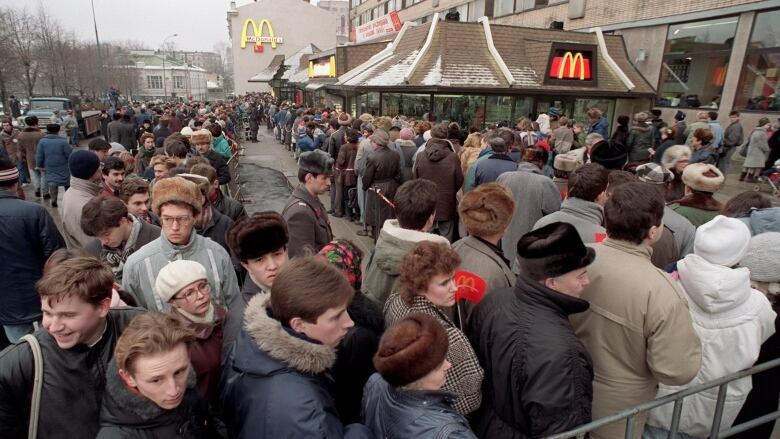 On Jan. 31, 1990, Muscovites had begun lining up near Pushkin Square as early as 4 a.m. — to enter the doors of the first McDonald's restaurant to open in the Soviet Union. It was, as CBC News anchor Peter Mansbridge announced, "an event of major gastronomic proportions" — the culmination of 14 years of work and an investment of $50 million. At the opening of what reporter Don Murray surmised might have been the "the world's largest hamburger stand," McDonald's Canada founder George Cohon used appropriately gigantic scissors to cut the ribbon on a truly gigantic restaurant opening. Inside, customers lined up again for Big Macs, fries and shakes. The reviews were mixed. One man felt the food itself was wanting, while some wanted more. "It's very beautiful," said one man. "But I expected more, I think." One woman, speaking in Russian, confessed to not knowing what it was she ate. But she did pronounce it "unusual and delicious," adding that "we need more of these places, there's nothing in our stores or restaurants." The restaurant, which was expected to be able to serve 15,000 meals a day, was not the only business to open under the McDonald's investment. Outside the city, some of the $50 million spent by the food giant went to build a processing plant dedicated to turning out 14,000 buns per hour, and where 3,000 tons of potatoes per day became fries and 10,000 patties per hour were made and frozen. But the revelation of the cost of a meal under the arches was not a happy one for some. At the price of half a day's average wages, the cost of trying out this new style of food was steep. 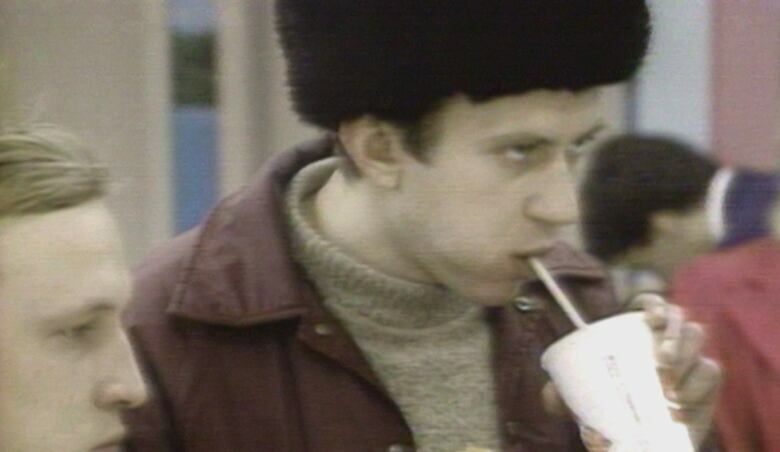 "Seven or eight rubles for lunch," said one man outside the restaurant. "They're ripping us off." The smiles, however, were free and plentiful and a happy surprise for some customers. As one waitress described it: "I smile to everybody, and they say what's wrong, what's wrong? ... They think that I'm laughing at them." The unequivocal success of the first day of his new venture brought out the poet in Cohon, who supposed that Pushkin might have written a poem praising the availability of "meat, bread, potatoes, and milk — of the highest quality." At the end of the day, 30,000 new customers had passed through the doors, and the store had set a McDonald's record for most customers served on an opening day.